The U.S. House of Representatives’ Select Investigative Panel on Infant Lives completed its investigation and report with a list of criminal and regulatory referrals against Planned Parenthood, other abortion facilities, universities, and companies trafficking in aborted baby body parts for profit. “The Select Panel was created to investigate the fetal body parts trade in the wake of undercover videos from the Center for Medical Progress (CMP) showing Planned Parenthood profiting from aborted baby body parts,” reported LifeSiteNews.com. The University of New Mexico was found to have violated their state’s Anatomical Gift Act by receiving tissue from a late-term abortion facility, Southwestern Women’s Options in Albuquerque, NM. The matter was referred to the New Mexico Attorney General for further investigation and prosecution. After conducting a forensic analysis of the limited financial data submitted by StemExpress, the Select Panel found that it was violating federal law by profiting from the sale of aborted baby remains. Referrals were sent to the El Dorado, CA, District Attorney and the U.S. Department of Justice. The Panel’s investigation revealed that StemExpress and “certain abortion clinics” were violating patient privacy rights under HIPAA for financial gain. A referral was made to the U.S. Department of Health and Human Services. It was discovered that an abortion facility in Arkansas violated the law by selling aborted baby remains to StemExpress for profit. A referral was made to the Arkansas District Attorney. The Panel uncovered evidence that a university in Ohio was violating state law by trafficking in aborted baby remains. An oral referral was made to the Ohio Attorney General. DV Biologics, a tissue procurement company, was found to have been illegally trafficking aborted baby remains for profit and had failed to collect California sales taxes. The Orange County District Attorney has sued and the Select Panel made a supplemental referral. It was discovered that Planned Parenthood of Gulf Coast broke the law when it sold aborted baby remains for profit to the University of Texas. The Select Panel referred the case to the Texas Attorney General. Advanced Bioscience Resources was found to have profited from the sale of aborted baby remains to “various universities.” A referral was made to the Riverside, CA, District Attorney. The Panel’s investigation discovered that Presidential Women’s Center in West Palm Beach, FL, violated the federal and state law though their relationship with StemExpress, which allowed it to illegally profit from the sale of aborted baby remains. The matter was referred to the Florida Attorney General. “The butchering of unborn babies for trade in the open market is barbaric. We must criminalize the sale or donation of baby body parts,” demands Texas Governor Greg Abbott. “Prenatal care – these are the kinds of services that folks depend on Planned Parenthood for,” stated Planned Parenthood CEO Cecile Richards. After a new report and video from the Pennsylvania Family Institute showed each Planned Parenthood affiliate in Pennsylvania does not provide prenatal services, even though they listed “prenatal” online, the abortion giant has since removed “prenatal” from their booking appointments website. “Prenatal” services still appears for each affiliate through internet search engines, reports LifeSiteNews.com. Another investigation conducted by Live Action documents that Planned Parenthood’s prenatal services are “virtually nonexistent.” Only 5 of the 97 facilities it contacted across the United States provided prenatal care. “As we see in these investigative videos recorded by Live Action, Planned Parenthood is not about preventative healthcare,” concludes Rep. Diane Black (R-TN), a nurse. “This is an abortion enterprise. In one video, we see 92 separate Planned Parenthood clinics turning away women who are searching for prenatal care, while a separate video shows 65 Planned Parenthood centers refusing pregnant women the opportunity to view an ultrasound,” reports Black. As the video documents, only 3 of 68 of Planned Parenthood facilities were willing and able to show ultrasounds to pregnant women who were seeking prenatal care and not an abortion. Do Planned Parenthood and its allies in the pro-abortion national news media think that all pregnant women are so stupid that they would go to a facility that specializes in destroying the life of an unborn child for prenatal care? The debunking of this lie that Planned Parenthood provides prenatal care follows the debunking of the lie that Planned Parenthood provided mammograms. After the Democratic National Convention, at which it was proclaimed that Planned Parenthood provided mammograms, it was shown that no Planned Parenthood facility had the equipment or staff to do so. Planned Parenthood doesn’t even claim to offer any pediatric care, which would be a primary concern for millions of women. Planned Parenthood receives $553 million annually from taxpayers, 43% of their annual budget, of which $430 million comes from the federal government. The balance of their taxpayer funding comes from state and local governments (Planned Parenthood 2014-2015 Annual Report). 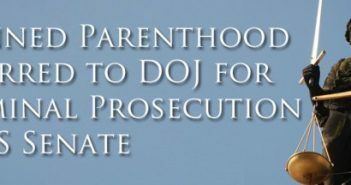 Planned Parenthood has been caught shielding child predators, lying about what services they provide, deceiving government officials, defying state and federal laws, submitting fraudulent Medicaid claims, and harvesting and selling fetal tissue. Because of their huge abortion business, unethical activity, and partisan political involvement, Planned Parenthood is one of the most divisive organizations in the country. The U.S. House of Representatives passed HR 7, No Taxpayer Funding for Abortion and Abortion Insurance Full Disclosure Act, by a vote of 238 to 183, with three Democrat members voting in support and no Republicans voting against. Such legislation is a ban on taxpayer funding of abortions. “This bill would permanently prohibit taxpayer dollars from being used to pay for abortions in Obamacare health plans starting the next plan year. This bill also protects Americans of conscience by requiring the full disclosure of abortion coverage in Obamacare plans so people can make informed decisions about their healthcare plans right now,” reports lifenews.com. One of President Donald Trump’s first executive orders was to reinstate the Mexico City Policy, first instituted by President Reagan and continued under the two Bush administrations, but which was overturned by President Clinton and President Obama. This policy defunds organizations like International Planned Parenthood that promote performing abortions in other nations. The Mexico City Policy simply requires that foreign nongovernmental organizations (NGOs) agree, as a condition of their receipt of U.S. federal grant money, to neither perform nor actively promote abortion as a method of family planning overseas. It does not impact the level of funding available; rather it sets a standard grantees must meet in order to be eligible for U.S. taxpayer funding. “And I think the reinstatement of this [Mexico City] Policy is not just something that echoes that value but respects taxpayer funding as well, and ensures that we’re standing up not just for life – for life of the unborn, but [also for]taxpayer funds that are being spent overseas to perform an action that is contrary to the values of this president – and I think continue to further illustrate not to just the folks here in this country but around the world what a value we place on life,” stated Sean Spicer, President Trump’s spokesman. It’s time for everyone to write, email, or call President Donald Trump, your U.S. senators, representatives, governors, state senators, and state representatives, to demand that no taxpayer funds, whether federal, state, or local, be given to Planned Parenthood, or any other organization that performs abortions. Now is the time to stand up for life.